Earlier today, Mayor Durkan announced a pair of initiatives that aim to reduce car traffic through downtown in the coming years. A $30 million package of near-term mobility projects will come online through the end of 2021. This period is called the period of “maximum constraint” caused by the Convention Center’s takeover of Convention Place Station and other downtown megaprojects. Simultaneously, the mayor announced ($) that the city would investigate a congestion charge and hopes to have it in place before the end of her first term in 2021. Both projects are connected, with a stated goal of reducing 4,000 SOV trips in downtown during peak hours by 2019. It remains to be seen if the two would complement each other, or become yet another addition to the transportation puzzle that already has missing pieces (namely the now-frozen Center City Connector). The same day the Seattle City Council approved a design for the Roosevelt RapidRide and endorsed plans to seek federal and state funding for the project, councilmembers were given a dismal prediction on the future of federal transportation funding. “It’s not a great picture,” said Leslie Pollner, a federal lobbyist for the city. She told councilmembers to expect significant cuts by the federal government in domestic spending, including public safety and transportation. The Roosevelt RapidRide project is expected to cost $70 million, with the goal of getting half of that funding from federal and state sources, said Councilmember Rob Johnson before the council voted to approve the preferred alternative Monday. “If we are unsuccessful in securing in that the department will bring back to us a revised proposal,” Johnson added. The vote committed the city to fully funding the development phase of the project at a cost of $4.3 million. 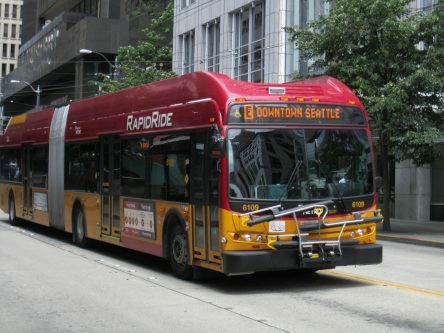 The Roosevelt RapidRide, estimated to decrease travel times by 20 percent, runs between downtown and the Roosevelt neighborhood via Eastlake and the University District. The project is one of seven RapidRide projects planned in the city in a partnership between the City and King County Metro. A previous STB post by Calvin Tonini describes the latest iteration of the project. 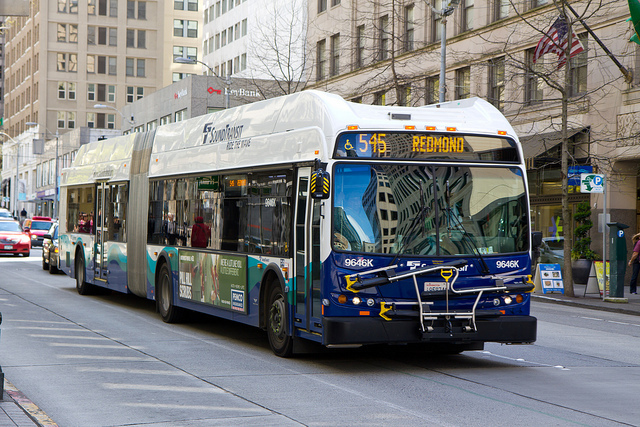 The city plans to apply for federal government dollars through a Small Starts grant program for both the Roosevelt and Madison RapidRide projects. Eastside mayors want Metro and Sound Transit to relocate bus stops to improve bus-rail transfers before implementing service changes. 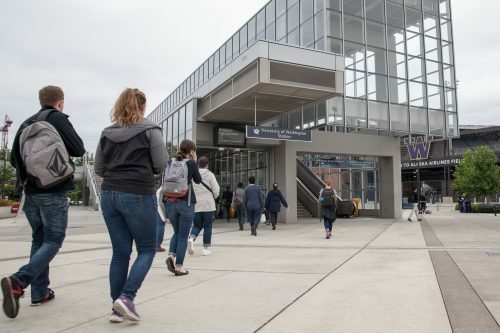 The proposed restructuring would funnel Eastside bus commuters heading downtown to light rail at the University of Washington Station. That transfer requires riders to cross the busy streets of Montlake Boulevard and/or Pacific Street or use an out of the way walkway to switch between modes of transportation. 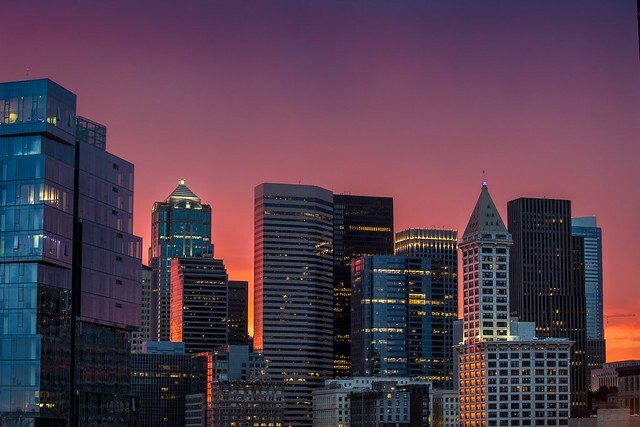 “Increasing commute times by 20 minutes while creating more mobility downtown will only incentivize single occupancy vehicles to drive to downtown Seattle rather than stick with public transportation,” wrote the seven Eastside Mayors in a letter to Metro and Sound Transit. The Mayors want bus stops relocated to be adjacent to the light rail station and mobility improvements through the Montlake Hub. STB’s own Adam Parast showed one way to accomplish this in 2015 (pictured below). “Sound Transit is supportive of improvements to the transfer environment at UW. 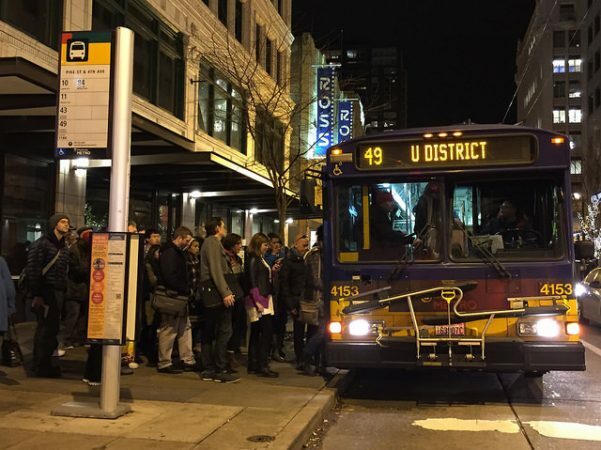 King County Metro owns the bus shelters, and they are in active conversations about this with the City of Seattle and UW,” wrote Rachelle Cunningham, a spokesperson for Sound Transit in an email. Metro estimates transfers currently take anywhere from 6-11 minutes, depending on direction and time of travel. “The service concepts we’ve introduced would increase frequency on many Eastside routes, which would help reduce the time that riders would have to wait at the stop,” wrote Scott Gutierrez, a spokesperson for Metro in an email. He said Metro is considering a range of changes, including relocation of stops, extending bus shelters, providing off-board payment and improving signage. One of the pieces of infrastructure on the bubble for being part of One Center City is a protected bike lane (PBL) on 4th or 5th Ave downtown. Unfortunately, it is being played off against bus travel time along those corridors. A 4th Ave PBL is expected to cost buses trying to transit 4th Ave an extra five minutes during rush hour, for at least a portion of OCC’s period of maximum constraint. Ideally, we should be able to have both improved transit speed and the bike lanes. However, no engineering solutions have been brought forth to enable both simultaneously in time for the constraint period. There is one element to the competing goals that should provide some moral clarity: Most of the bus routes on 4th and 5th Ave will be there only a few more years. The PBLs would be there forever. The vast majority of buses on 4th and 5th are express bus routes, with most under consideration to be replaced with Link connections as the transit spine gets built out. 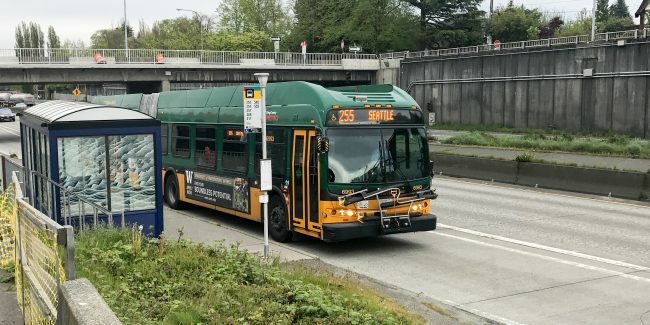 Some of the routes will leave downtown forever when the buses get kicked out of the transit tunnel, assuming an SR 520 route restructure is approved. Several more routes will disappear when Northgate Link opens in 2021. An overwhelming majority of the bus routes on 4th and 5th will be gone by the end of 2023, when Lynnwood Link and East Link are scheduled to open. As time goes on thereafter, more buses will be added, as downtown is expected to keep adding jobs, can’t add cars, and the buses tend to run full during peak. Hopefully the engineering and political will will come along to optimize bus throughput. And hopefully, a well-used PBL grid will absorb a non-trivial chunk of the new trips. A countervailing force, as Scott Kubly pointed out in last week’s podcast, is that density leads to walkability, and walkability converts former bus and car trips into walking and bike trips. Since there is only so much we can do to get more people in and out of downtown, it behooves the City to double down on allowing thousands more people to live stacked on top of each other downtown. Of course, we still want every available tactic to be deployed to speed up transit. A grid of protected bike lanes is one of those tactics for which we can’t wait any longer. A recent presentation on One Center City / Convention Center expansion construction plans teased the possibility of an off-board payment zone on 3rd Ave all the way from Jackson St to Denny Way Ave, with all-door boarding. King County spokesperson Scott Gutierrez quickly threw cold water on the tease by pointing out that the plan amounted to adding RapidRide-style off-board ORCA readers at each bus stop on 3rd Ave, as an additional payment option, all-door boarding, cash payers still paying while boarding at the front, and random fare enforcement on all the buses that traverse 3rd Ave. The county is considering other measures to reduce the impact of front-door fare payment by (1) buying out the ORCA card fees for cards distributed at county facilities and possibly other facilities in King County; and (2) eliminating the zone and peak surcharges on Metro buses. Policy changes like eliminating paper transfers, having a cash surcharge, and making the cash fare an even $3 appear unlikely to be proposed, much less stomached by the county council. Even if they were, they still wouldn’t eliminate the impact of front-door change fumbling on 3rd Ave. Nor does it appear likely that Metro or the council will expect everyone to get an ORCA card and keep it filled with ORCA product in order to be able to board on 3rd Ave. There is another way to remove front-door fare slow-downs on 3rd Ave, and it is something that’s been used before, to great effect: a Ride Free Zone (RFZ). The problems with the original RFZ included excessive dwell time waiting for passengers to push to the front and pay as they exited, and the mass confusion of when people were supposed to pay while boarding or wait until alighting. Thankfully, Metro’s plan to deploy fare enforcement on all the 3rd Ave buses, but not necessarily on 3rd Ave, helps solve that problem. 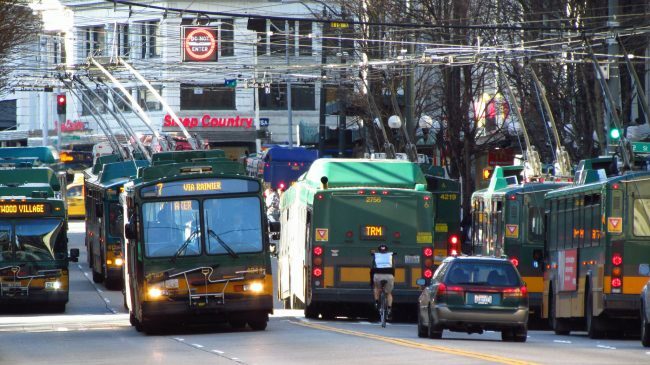 A new RFZ would deliver the additional benefit of moving fare enforcement off of 3rd Ave, where it would be difficult to do on crushloaded peak-hour buses. Those paying with ORCA will be able to tap a reader on 3rd Ave before boarding, board at any door, and then exit at any door when they reach their destination, with or without an RFZ. The One Center City plan for handling near-term disruption in Seattle downtown transit and traffic grinds forward. Anticipating the end of bus operations in the Downtown Seattle Transit Tunnel, staff are narrowing down the options. At last week’s advisory group meeting, we learned several project elements that are moving forward, and some that are not. It’s not clear whether the pared down program of operational improvements will be enough to prevent a substantial deterioration in service performance. Meanwhile, the exit of buses from the tunnel, previously anticipated for September 2018, is likely to be delayed. On Monday, the King County Council Committee of the Whole approved an amendment delaying Metro’s vacation of Convention Place until at least March 2019. If the Convention Center doesn’t have its permits by June 2018, or if WSCC is not ready to take over the site by September 2018, then joint operations could continue until at least September 2019. The delay might allow another look at One Center City options that need more time for implementation. 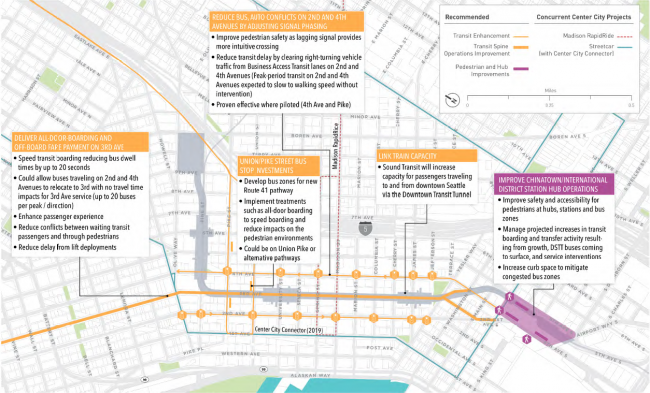 The earlier proposal to terminate ST 550 at International District Station was dropped because of adverse impacts to riders compounded by East Link construction elsewhere on the route. The closure of the D2 roadway in late 2018 mean route revisions remain necessary, but the 550 will be operating through downtown on surface streets once the tunnel closes. It is not expected to operate on 3rd Avenue. Several open houses are scheduled for the public to learn about new service on the SR 520 corridor. The first is on Wednesday evening in Kirkland, with others to follow through the rest of the month. A particularly interesting opportunity is the open house at UW Husky Stadium on June 19. As well as the regular open house exhibits, staff members will guide tours of the bus-rail transfer experience. Another way to participate is through the online survey which is open until June 30. As we reported last week, Metro and Sound Transit are seeking public input on several service options on the SR 520 corridor following the closure of the downtown bus tunnel and other service-impacting changes. 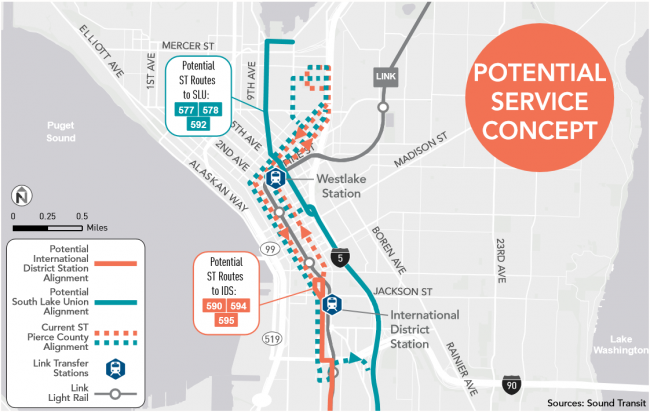 The revisions being considered will end most direct service to downtown Seattle across SR 520, but increase frequency and service connections on the Eastside. Open house details after the jump. Last evening, Metro and Sound Transit released service change concepts for revised bus service on SR 520. This kicks off the second of three rounds of public input, including an online survey and several open houses in mid- to late June. Because these are service concepts, they do not describe capital improvements in Montlake or elsewhere could be combined with either service option. Ten routes, six Metro (252, 255, 257, 268, 277, 311) and four Sound Transit (540, 541, 542, 545), are included. Two all-day routes, Metro 255 serving Kirkland-Seattle and Sound Transit 545 serving Redmond-Seattle, carry two-thirds of current ridership. 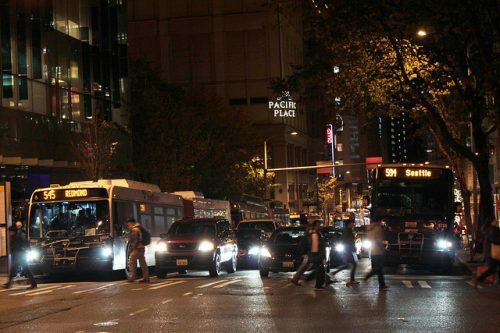 As expected, many buses that currently serve downtown Seattle would be rerouted to UW station freeing resources that would otherwise be consumed in downtown congestion. Changes would take effect ahead of the closure of Convention Place Station, currently scheduled for Fall 2018. Either alternative improves cross-lake service for most riders, excepting those who prioritize one seat rides to downtown over all else. But the reinvested service hours target different priorities, and many riders will consider their individual circumstances in figuring which option they prefer. A notable highlight of the proposals is that both options include new service between South Lake Union and the Eastside. Very helpfully, the Metro website separately describes the options, including pros and cons of each, for the major Eastside markets served: Kirkland, North Kirkland/Woodinville, and Redmond. Sound Transit’s website has maps for each market under each option: Kirkland, North Kirkland/Woodinville, and Redmond. After the jump is my summary of the system-wide changes. Senior, disability, youth, low-income, and Access fares would not change. Regarding the #1 criterion among surveytakers, affordability, Metro is already on the cutting edge in the industry internationally, not just domestically, with its ORCA LIFT low-income fare card. It also gives out lots of tickets to human service agencies, which then give them out to clients who can’t afford any bus fare, in a program that is not so cutting-edge. Mobile ticketing provides another option to avoid annoying your fellow passengers by fumbling cash. Perhaps it should be cheaper than paying with cash. Part of the low-hanging fruit that could help transit move more smoothly when Convention Center Annex construction and other projects reduce throughput in the Central Business District would be streamlining the fare collection process on all buses. Both Metro and the monorail are collecting input on fare change proposals. Metro’s is focused on moving to a flat fare. This author has long been a proponent of express fares based roughly on distance. However the likelihood that there will be no express bus routes entering downtown from the north end or I-90 after Lynnwood Link and East Link open changes the calculus. If only South King County express routes are left, trying to charge premium express fares to the portion of the county with the lowest average income seems pretty pointless. Moreover, with One Center City bus re-reroutes right around the corner, drastic actions have to be taken to keep buses moving. Fare simplification is overdue, and now desperately needed. King County Metro and Sound Transit have begun an outreach process to transit riders in the SR 520 corridor. Transit users and community members are invited to take a survey, running through April 2. Town halls will be held at University of Washington, in Redmond, and in Kirkland. This will be the first of several opportunities for public input planned as service proposals evolve. Six Metro routes (252, 255, 257, 268, 277, 311) and six Sound Transit Express routes (ST 540, ST 541, ST 542, ST 545, ST 555, ST 556) may be affected. Generally, the agencies are interested in truncating most service on SR 520 to the University of Washington light rail station. Several of those routes already serve UW, so possible service changes go beyond simply truncating the remaining routes to downtown. Candidate routes for truncation at UW serve Kirkland, Redmond and Woodinville. A final proposal is also expected to include more frequent service on many routes, along with more service earlier or later or on weekends. New service between the Eastside and South Lake Union will be considered. The immediate impetus for service changes on SR 520 relates to several construction projects in central Seattle including the anticipated closure of the bus tunnel and Convention Place Station by the end of 2018. Absent other changes, bus performance through downtown will be slowed significantly. The One Center City proposal truncates many bus routes at rail stations outside of the downtown core. Some of the changes are temporary remedies until Link extensions to Northgate and Bellevue are open. On the other hand, changes to SR 520 bus service offer permanent benefits to riders if executed well. Rail to downtown is faster and more reliable than buses on I-5 and surface streets. The service hour savings can be redeployed to more frequent service on Eastside buses or service to more places. But understandable concerns about the efficiency of bus to rail transfers at UW remain. STB has done a deep dive into the street overhauls and bus service restructures being considered by the One Center City project. If you haven’t already done so, please Participate in the online open house, and Comment at the site. The comment form is just an open-form text box, and there are no surveys to complete. We hope that you will take a few minutes to comment in favor of these principles and ideas. Comments are due by Friday. For more background, our posts on One Center City can be found here. Crises inspire clarity and focus, and One Center City is no different. Our whirlwind of overlapping projects usually overwhelms us with extended process and mind-numbing rounds of design revisions and open houses. But Seattle in 2017 faces an historic convergence of projects that prevents us from such discursive luxuries. If we do nothing, we face 3 years of misery from 2018-2021 until Northgate Link saves the day. We have to act quickly and boldly. In a Center City where 70% of commuters (and 95% of new commuters) do not drive alone, it should be crystal clear where our priorities lie. From Vision Zero, our Bike and Transit master plans, to our climate commitments, or to a cold utilitarian optimization of space, One Center City should head in only one direction. We must enhance transit, walking, and bicycling, and deemphasize peak auto access. Since the geographic constraints of our city are immutable, our dilemma is not ideological but geometric. As such, there are only two ways to make traffic better: transcend it through a more efficient use of space, or hope for recession, depopulation, and urban flight. Which would you prefer? Ok, so we’re definitely not ready for the Big One. 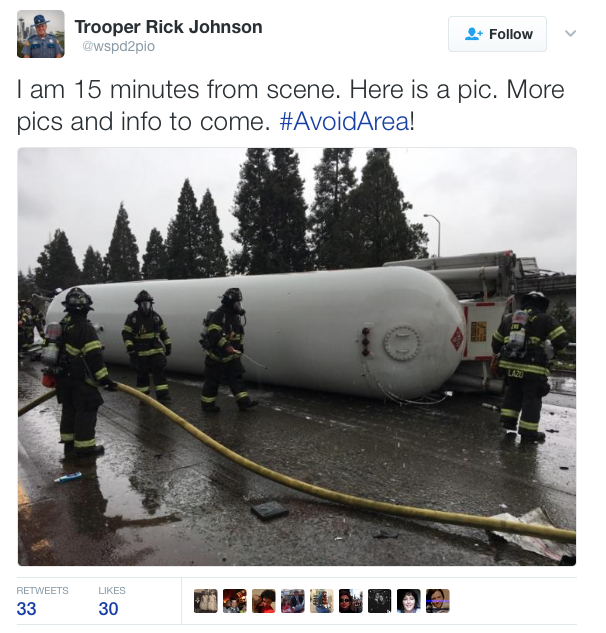 The ‘quake’ that was felt in Seattle on Monday was due to a single tanker truck, overturned and leaking butane at the I-90/I-5 interchange. At 10:30 Monday morning, the overturned truck caused a closure of I-5 in both directions that lasted until after 7pm. Crews worked to upright the tanker but also kept the scene clear for safety reasons. 20 months after we rage-laughed at ourselves on behalf of a salmon truck bringing us to our knees, this closure was far worse. Throw in a bitterly comical coup de grâce of thundersnow, and we truly had a meltdown for the ages. 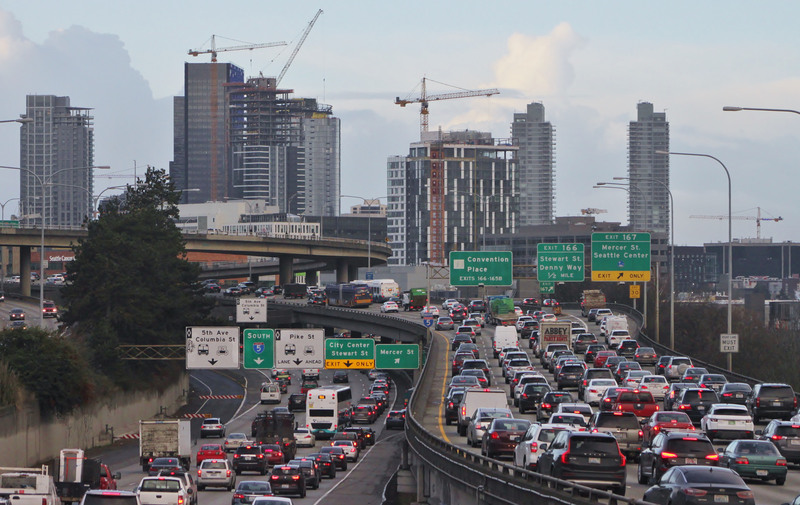 I-5 traffic was dead stopped for 8.5 hours, and southbound drivers’ only respite was to exit onto downtown surface streets, leading to intractable gridlock. Buses quickly fell behind, many of them two hours behind, the First Hill streetcar gave up and stopped operating on Broadway, and at one point there were twelve RapidRide D coaches bunched between Denny and Mercer in Lower Queen Anne. The West Seattle Water Taxi was turning people away on each run, and streets like Stewart were wall to wall with idling buses and cars. Normally placid side streets on Capitol Hill such as Belmont and Boylston – where I tell people I live in ‘the eye of the storm’ – were also gridlocked. Aside from knock-on delays from tunnel bus unpredictability, Link light rail performed swimmingly, almost as if nothing at all was happening. We received two reports from Eastside commuters who had no trouble traveling from Kirkland to Capitol Hill at 4pm via bus and Link. Twitter was abuzz with frustrated souls wishing ST3 had been finished yesterday. What was your experience like Monday? What did you notice? Below are a selection of reader-submitted photos. 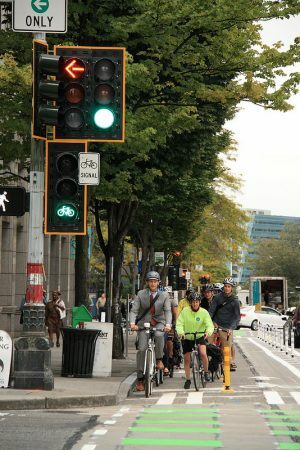 Last week Commute Seattle came out with its biennial Modesplit Survey, showing more incremental progress towards a culture of walking, biking, and taking transit to work. In follow up discussions both internally and in comment threads, we’ve wondered about the balance between this cultural shift and the way we allocate our right-of-way. As One Center City prepares both short-term mitigation measures and long-term structural changes to our Downtown streets, it’s important that our right-of-way allocation align with the same progress we’re celebrating. Getting a sense of which modes get proportional allocations isn’t terribly easy. Bus and bike lanes are discontinuous, bus lanes are often peak-only, and street widths vary with curb cuts, etc. (For a citywide perspective, Brock Howell had a great guest post in the Urbanist last year). In an attempt at getting our heads around Downtown, I counted 536 blocks in Center City (bounded in my definition by 1st Avenue, Mercer, I-5, and Jackson St). I then counted the total number of lanes on each of these 536 blocks to come up with the total number of ‘lane segments’ in Center City: 2,296. For simplicity, I counted parking lanes as full lanes, no matter their width, because they are still scarce space continually occupied by cars. On these 2,296 lane segments, there are 150 lane segments of bike lanes (6.9%) and 160 lane segments of bus lanes (6.5%). The remaining 1,986 lane segments (86.4%) are taken up by general purpose lanes, on-street parking, and delivery/loading zones. Off-peak, only 40 lane segments of bus priority remain (1.7%), mostly on Battery, Wall, and Westlake Avenue. A few caveats are in order. I counted all streets, even those on which you’d never expect transit service (Clay, Eagle, Terry, etc.). I did not count the Downtown Seattle Transit Tunnel (DSTT) in the ROW allocation, only looking at the surface. And I treated ‘blocks’ as a consistent entity, even though their length varies, especially on the shorter blocks of south Downtown. But the intent is just to depict visually how much raw space to which cars are entitled, and how much we’ve set aside for bikes and transit. I hope it’s helpful as One Center City discussions move forward. Sound Transit had the right idea when it proposed a new route, ST Express 591, from Tacoma to north downtown Seattle via the Seneca St exit from I-5, in its 2015 Service Implementation Plan (page 94). The proposal included forcing riders from Tacoma currently riding ST Express 586 to transfer to Link Light Rail to get to UW. In light of the congestion downtown faces from 2018 to 2021, keeping route 586 for the time being makes sense. Since the elimination of route 586 was ST’s reason for proposing route 591, route 586’s continuance after U-Link opened would explain why the awesome route 591 proposal vanished from the pages of the SIPs. 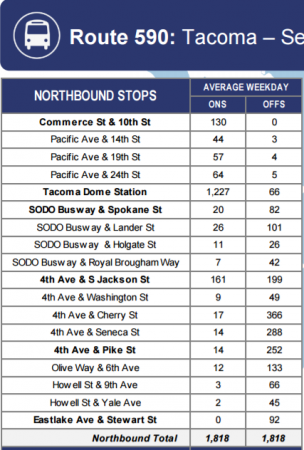 However, stop-level boarding and alighting data from the 2017 Service Implementation Plan (See page 221) gives strong justification not only for route 591, but also giving such a new route the majority of service on the Tacoma-Seattle bus corridor. 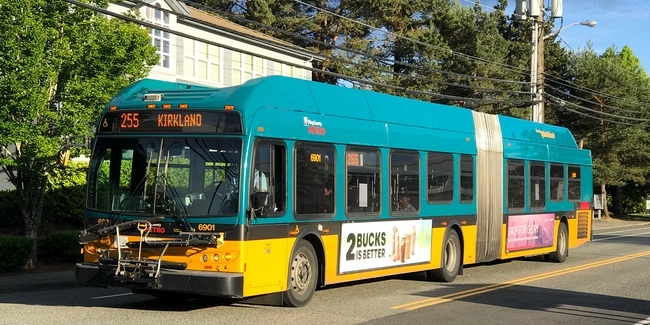 Add two more Sounder round trips coming in September, and it should be clear that route 591 ought to be the dominant peak bus path between Tacoma and Seattle. Throw in having route 591 continue into South Lake Union to take advantage of the new transit lanes (as is proposed for route 592 — See the solid teal line in the map at the top of the post), and some organic lemonade could be made out of the One Center City restructure proposals. The Potential Service Interventions (page 20) being discussed by the One Center City Advisory Group include the possibility of truncating route 590 at International District / Chinatown Station. Having route 590 truncated at ID/CS would have hundreds of riders transferring there daily to get across downtown, on buses and trains already packed to the gills. However, if Tacoma-Seattle service were split into routes 590 and 591, riders coming from Tacoma would be able to get relatively direct service to whichever part of downtown they are headed toward. Such a proposal would make a lot more sense than truncating all route 590 service or all route 550 service (page 17) at ID/CS.